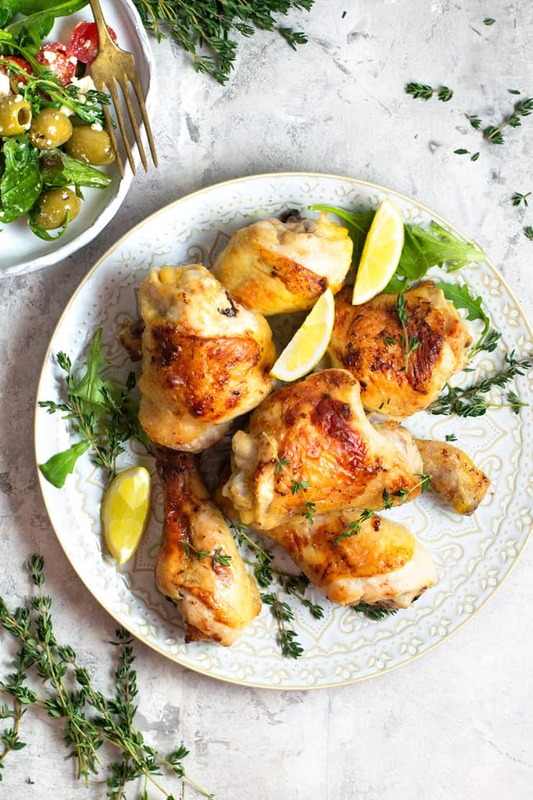 This delicious Greek chicken has just 3 simple ingredients and is ready in about 30 minutes, a perfectly easy weeknight meal! Serve over rice or potatoes with salad or veggies for a gluten free, dairy free, and super satisfying dinner! We had a weekend full of family gatherings and I’m kicking off a 3 day week before boarding a plane to attend a conference. I’m excited about what the week holds but, to be honest, thinking of all that needs to get done in the next 72 hours makes me a little nervous. I know you’ve been there too. It’s weeks like these when easy dinner recipes like this 3 Ingredient Greek Chicken really come to the rescue. I can shave off some time in the kitchen, and my family still gets to sit down together around a delicious, healthy, home-cooked meal. This simple, marinated chicken recipe really could not be easier. Just marinate two pounds of chicken thighs and drumsticks in my homemade Greek salad dressing for 12-24 hours, then brown on the stove and finish in the oven. My Greek dressing is one of our very favorites, so I always have a batch in fridge. 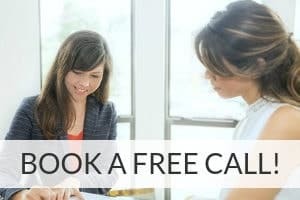 But, even if you don’t already have some on hand, it only takes a few minutes to mix up and I guarantee you’ll love it! Let the chicken marinate for as long as possible as it makes the chicken tender and full of flavor. You can easily adapt the marinade with fresh herbs and spices according to your preference. 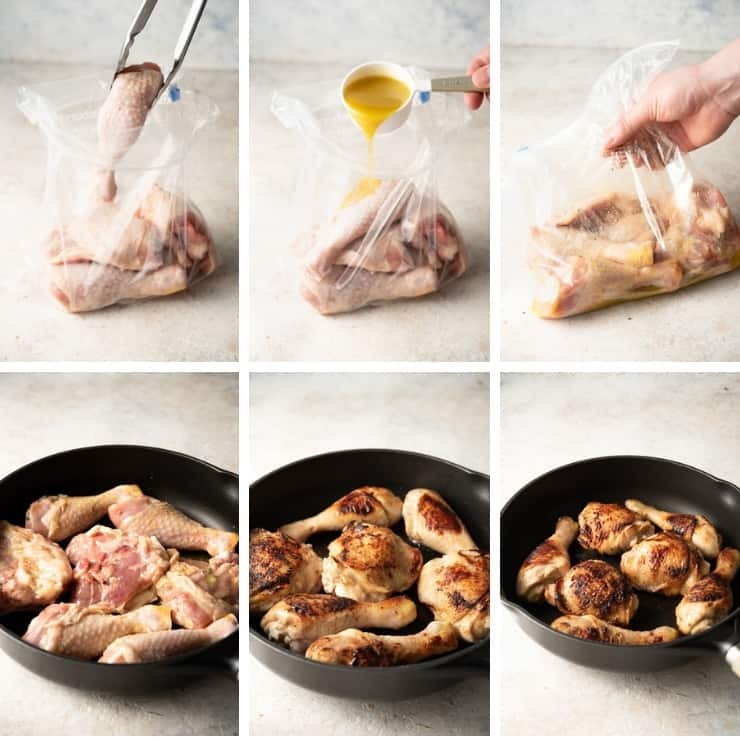 You can use this method for marinating chicken with your favorite sauces. Serve this chicken with rice or potato wedges and a big salad or grilled or roasted veggies. Leftover chicken makes fantastic sandwiches or salad topper! 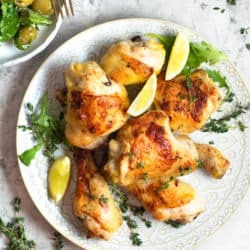 Moist and delicious Greek chicken made with only three simple ingredients and ready in about 30 minutes! Place chicken and Greek dressing in gallon zipper bags and allow to marinate in the refrigerator for 12-24 hours, turning once halfway through. Place chicken and marinade into a large, oven safe skillet or Dutch oven. Cook on stove over medium high heat for about 10 minutes, turning halfway through so that both sides of chicken are browned. Transfer skillet/Dutch oven to oven (uncovered) and cook for approximately 20 minutes, or until chicken is thoroughly cooked. Remove from oven, garnish with fresh thyme, and serve. Would chicken breasts work as well? My family won’t eat legs or thighs. Hi Melanie, thanks for reading and for the question! Yes, chicken breasts would work, though you would need to either cut them into halves or thirds, or increase the cooking time in the recipe. Breast meat would also make a great topper for Greek salad! If you try them, I’d love to hear how they turn out! Oh wow! Three simple ingredients and ready in about 30 minutes? That is everything I need, that’s for sure! 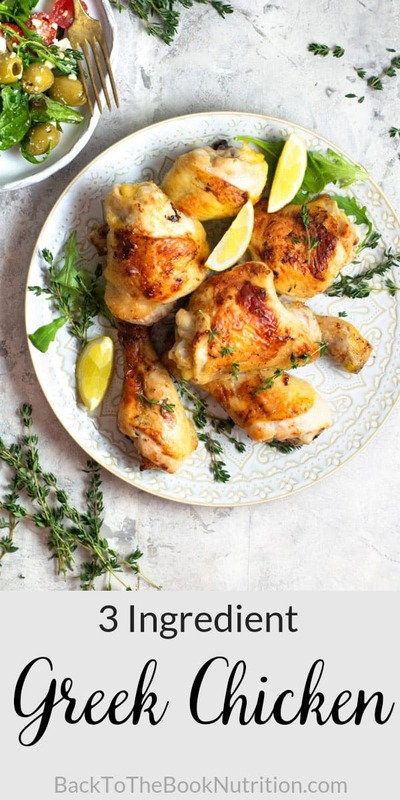 I love chicken and I love simple recipes like this even more! We always use Italian dressing – no idea why I never thought to use Greek before but YUM! Can’t wait to make this! I LOVE LOVE LOVE the recipe of this chicken. I like the easy and short list of ingredients. This looks so delicious! Is good food and this looks like one of the BEST!! It certainly sounds easy and we do enjoy our chicken legs and thighs. We like breasts but I believe you have to be careful that they don’t dry out. We’ll try out your recipe. I’m sure you’ll get a lot out of the Blogger conference. Have fun!! This looks like a delicious recipe. I love greek salad dressing and this sounds so wonderful. Saving this for later. This chicken looks SO good! I don’t know if I’d want to share! My family loves these flavors, plus it’s so simple! Simple and delicious chicken that too with only 3 ingredients you got me . I need to make it for my hubby and son they love chicken. Greek salad dressing is brilliant to use as a marinade. It really makes this dish flavorful and super easy to pull together in limited time! 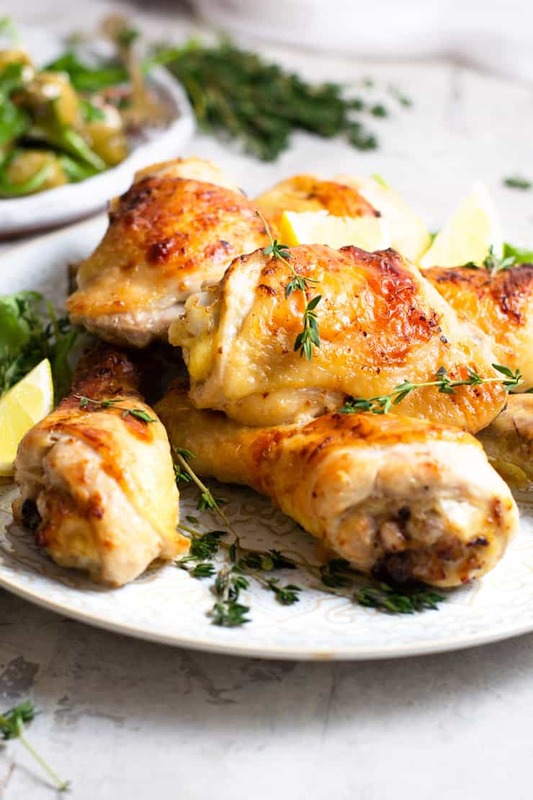 I love the beauty and ease of this delicious Greek chicken recipe. Perfect for a mid-week meal! It’s definitely one of my go-to’s – I hope you love it too! you had me at 3 ingredient! 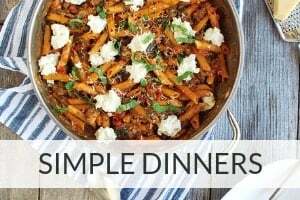 what an easy and tasty weeknight meal. totally adding this to the menu list! I need this in my life! Greek chicken in salads is so good and my all time favorite. And that you can make in with 3 simple ingredients in 30 minutes…brilliant! Saving this recipe. Gonna try it for sure. It’s GREAT on salad – hope you love it, Jo!